It's no secret lately that I have put my family on a health kick. I'm still easy going with the sweets for the kids, but I'm subbing in more fruits and veggies wherever I can. And I feel like I am making so much progress. In less than two months, the boys are eating so many more veggies than before. We still have meals where they fight me here and there, but I have noticed such a difference. 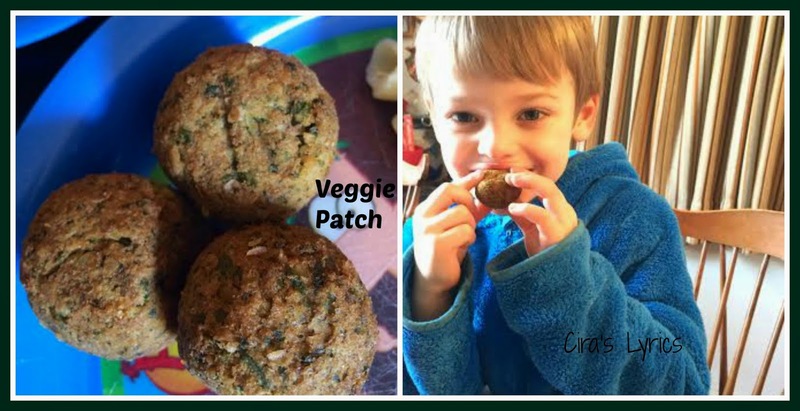 A few weeks ago, I was contacted by someone with Veggie Patch about trying their products. In the interest of disclosure, they sent me a few coupons to try their product for free in exchange for a blog post and social media promotion. I was excited to give them a try after looking at their website and finding that this was not a frozen product. The boys and I looked everything over and decided to pick out the Spinach Nuggets ... (OK I was the one that decided on the spinach) ... but they agreed with getting the Falafel Chickpea Balls and Broccoli Bites. When we got home, the boys had me heat up the falafel right away. You know how much they love falafel. They have come a long way since the first time they tried it and now ask for it frequently. It was a hit. I actually liked the falafel more than the ones we purchase from both our local Whole Foods and some restaurants. I only have one child who likes broccoli, but all three boys agreed that the broccoli bites were 'sort of good Mom'. (Progress!) These were my favorite. My husband and I couldn't stop eating them. And then there was the spinach. More honesty. I have no love for cooked spinach. I can put it in a smoothie or a salad. But once I cook it? Not a fan. I do like spinach pies but you will find me scooping out more than half the spinach inside first. Well ... these spinach nuggets were actually delicious. The boys don't eat spinach either, but they all tried (and ate) a nugget the day we opened that package. Here's what I love about Veggie Patch. Not only are they fresh, but they are GMO free, Trans fat-free, and free of artificial flavors or preservatives. And a great source of protein which I can always use more of. These are items I would never take the time to make for myself at home. Picking it up from the refrigerated section makes all the difference for me. One of the biggest challenges I have lately when it comes to eating healthy is the days I am on the go. Audition for the boys, sports practice and more. That is when my healthy goes down the tubes because I'm not home long enough to cook. This is so easy to grab out of the fridge and get ready in a few minutes. And it's healthy. I know I've found three favorites already, but I am looking forward to trying their other products as well. I highly recommend Veggie Patch. In addition to their website (where they have some recipes as well as a section just for kids), you can check them out on Facebook and Twitter. These days, Nike is probably the best sports-inspired way of life manufacturers which has were able to contain the curiosity from the youthful as well as aged as well. louis vuitton replica You are able to look for Nike totes depending on your financial allowance, objective, way of life, design, as well as character. fake chanel The most typical type of totes this particular manufacturer styles as well as companies consist of: chanel replica sale School bags -- These types of possess lengthy loved a unique devote numerous people’s minds. Nike school bags usually function 2 flexible connectors which permit you to have the actual tote according to your own comfort and ease. chanel replica sale The freezer drawing a line under guarantees your own possessions tend to be safe. fake chanel A few school bags additionally function d additional room for the laptop computer.